Wellness, mindfulness, and work/life balance are issues often mentioned by law librarians and also frequently ignored. Though much has been written about mental health and wellness related to library users, fewer resources are available for library staff concerned with their own well-being. Over the last few years, conversations surrounding wellness in law libraries led the Research, Instruction & Patron Services Special Interest Section(RIPS-SIS), Legal Information Services to the Public SIS (LISP-SIS), and the American Association of Law Libraries (AALL) to collaborate on a white paper focused on self-care for library staff. Written by eight authors with different perspectives and backgrounds, this white paper presents best practices—and hopefully starts a much-needed conversation—about caring for not only our stakeholders and our patrons, but ourselves and each other. 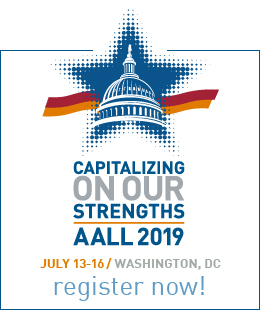 If you have any questions or comments about this white paper, please contact AALL Publications Manager Heather Haemker. 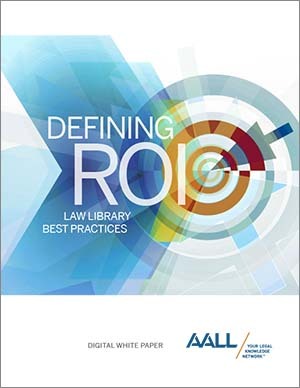 Building on AALL’s 2015 The Economic Value of Law Libraries report, the white paper provides proven strategies and solutions for demonstrating value and return on investment (ROI) for libraries. The legal market demands that legal information professionals identify, measure, and communicate the benchmarks and metrics of value. 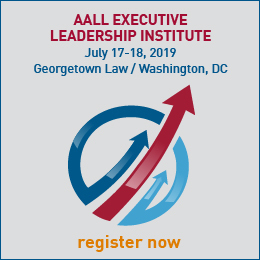 Contributors from across the AALL community have mined their own experiences to share their measures for success, creating engaging and practical guides for defining ROI. The articles draw from renowned historical sources such as the Five Laws of Library Science by S. R. Ranganathan and also highlight the contemporary knowledge of Don Draper, the iconic fictional ’60s ad man from the TV show Mad Men. These varied approaches to this topic are illustrative of the myriad of ways to demonstrate value. The goal of the white paper is to spark creativity and innovation for measuring value within the profession. 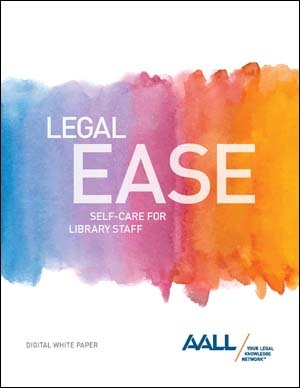 AALL acknowledges Fastcase for its generous support in the production of the white paper. 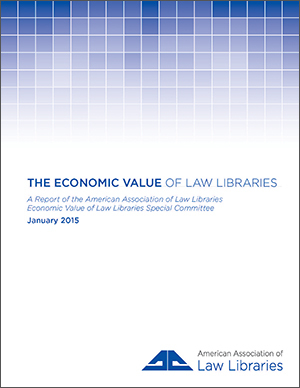 This report is the result of the AALL Economic Value of Law Libraries Special Committee’s efforts to provide members with the best methods for reporting the law library’s value to its stakeholders. The Special Committee retained HBR Consulting to study and report on valuation methodologies law librarians can use to identify the most effective means for communicating value. This study does not provide a dollar value for our services. Among the law libraries in AALL, our services are too varied and our parent institutions too diverse to render a single value meaningful. What the report does provide is research and best practices for each library manager to use to determine the value standards held by their own organization and how those values are measured and reported. The report offers guidance for each librarian in determining how best to align their services to their organization’s mission. Since even the best services may go unrewarded if not recognized, the report describes methods for reporting the library’s value to its important stakeholders. 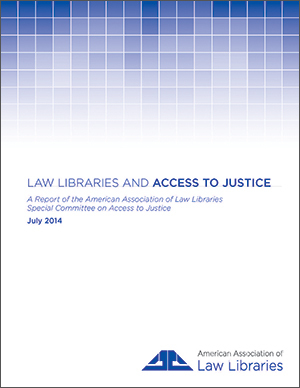 Created in 2014 by the AALL Special Committee on Access to Justice.